Private tour guide for your group one-on-one training. Wharf, Waterfront, Little Italy and Hills of SF Tour in one amazing guided tour, a 3-hour experience that includes extra time for riding. Tour at your own pace with more time for stops and photos. Hills section of route may be adjusted or cancelled based on rider's ability. Cruise through Aquatic Park and to the end of Municipal Pier. See the San Francisco Maritime National Historical Park, wonderful panoramic views of Alcatraz, the Golden Gate Bridge, and splendid and unforgettable vistas of San Francisco bay. Climb the slopes of Russian Hill - the affluent residential neighborhood’s name goes back to the Gold-rush era when settlers discovered a small Russian cemetery at the top of the hill. Enjoy panoramic and picturesque views of Alcatraz, Coit Tower, the Bay Bridge, and the San Francisco Bay. See some of San Francisco’s 350 hidden stairways and car free, pedestrian zones. Climb past the Cable Cars to the peak of Lombard Street, the most serpentine street in the world. 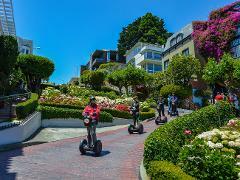 Ride down the world’s most famous “crooked street,” then cruise toward North Beach down the slopes of Telegraph Hill. Explore North Beach - the city’s most European neighborhood, with a predominantly Italian flavour. Recently honored as one of the 10 great neighbourhoods in the country! Have a pause and enjoy visiting Saints Peter and Paul Church in Washington Square Park, the centre of Little Italy. Pier 39: home to San Francisco’s famous sea lions and is one of the top tourist attractions in the nation. Glide past the Historical Wharf Fishing Fleet. Get a waft of the refreshing ocean breatheas we scoot back to the starting point. The Hills section of the route can be adjusted or even cancelled depending on the rider’s ability on one hand, and guest safety on the other; after all, we care much for our guest’s safety! Route changes are at the discretion of the tour guide or manager; however, the tour will continue, as planned, for 3 complete hours of exciting activity. All riders are age 12 years or older. No riders are pregnant. Due to fall risk no pregnant guests are allowed. 72 hour cancellation policy: Any changes / cancellations within 72 hours will not be refunded or rescheduled. "private guide this the best way to discover city in right way!!"